Banjo-Kazooie is one of my favorite 3D platformers as evident by this top ten from last week. It seems likely then that I would fall head over heels in love with its spiritual successor Yooka-Laylee, made by many members of the same team. Is that exact what happens? Not quite. See why with my review. Note: This review is based on the PlayStation 4 build. Move over, bear and bird, it's the lizard and bat's time to shine! Yooka-Laylee was backed on Kickstarter, and it's one of the crowdfunding website's greatest success stories. The desire for a modern game crafted like Banjo-Kazooie was indeed palpable, and that desire led to Playtonic Games forming, a collection of former Rare talent whose past games included Banjo-Kazooie and Donkey Kong 64. Now that fan wishes have come true, did Yooka-Laylee turn out well, or is it another spiritual successor failure of the likes of another Kickstarter success story, Mighty No. 9? The male lizard and female bat pair of friends, Yooka and Laylee, spend a quiet day at their home in Shipwreck Creek. Suddenly, their nearby neighbor, Capital B at Hivory Towers, begins sucking up books and pages left and right, including one of Laylee's prized tomes. The pair wind up at the menacing corporation, ready to take down the business acumen of Capital B, his vice president Mr. Quack, and get Laylee's book back. If you're looking for a bright and colorful 3D platformer, you've got one with Yooka-Laylee! 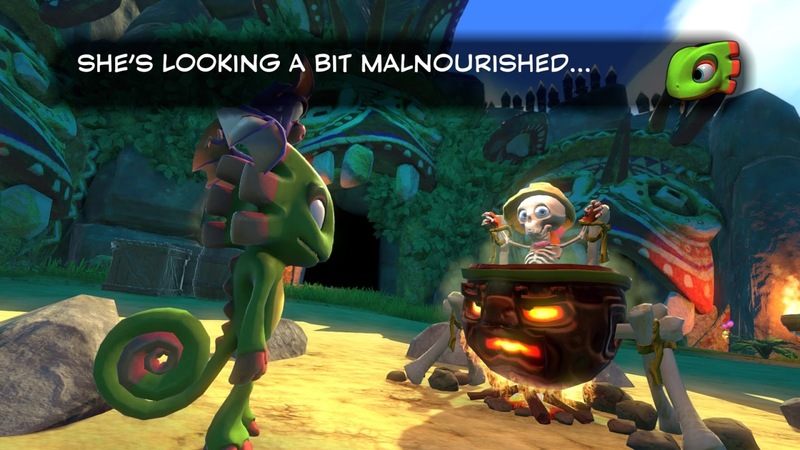 Yooka-Laylee presents its story with as much cheekiness as you'd expect from former Rareware and Banjo-Kazooie staff. The familiarity is nice with Yooka's politeness, Laylee's snarky attitude, and a host of characters each with their own specific quirks and personalities. The humor is on point, self-referential, and something that I think all but the most jaded of people can enjoy. Perhaps the lack of traditional voice acting may present itself as a bother, instead going for the Banjo-Kazooie approach of repetitive grunts and other noises rather than real speech. For me, as a lover of Banjo-Kazooie, this speech wasn't an annoyance. Yooka sure is one to understate things while Laylee uses much more direct tactics. 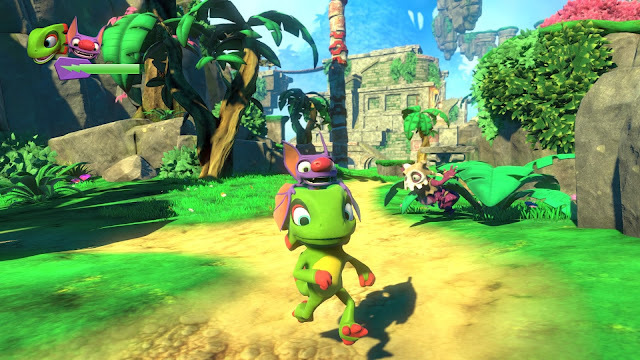 Right away, Yooka-Laylee delivers bright, vivid, colorful, and cheery visuals, offering delightful 3D worlds. Each world gives off its own ambiance, and the music that accompanies them are wonderfully done. The soundtrack feels directly riffed from one of Rare's Nintendo 64 3D platformers, perfectly done by the team of Grant Kirkhope, David Wise, and Steve Burke. Unfortunately, the beauty of the game is sometimes marred by frame-rate stutters that can be rather severe, occasionally appearing to freeze for a split-second before chugging along as usual. Here's hoping that Playtonic will address this in a future patch. place in the game, it looks quite nice. 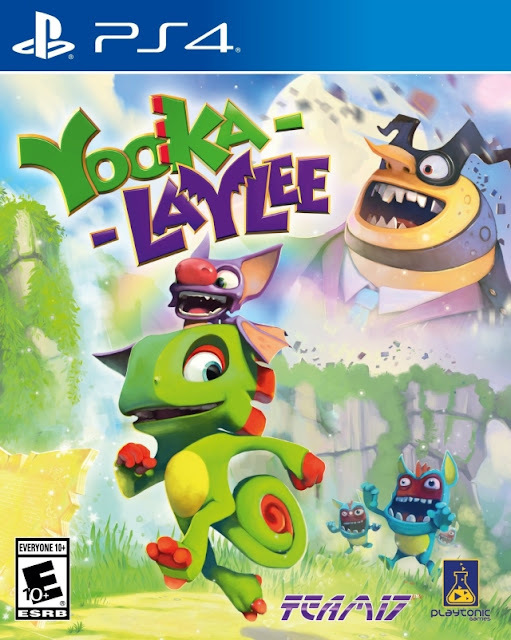 Moving on to the actual game part of things, the primary goal of Yooka-Laylee is collecting, and there's a good amount of it-- hence the "collect-a-thon" moniker that games of these types get. 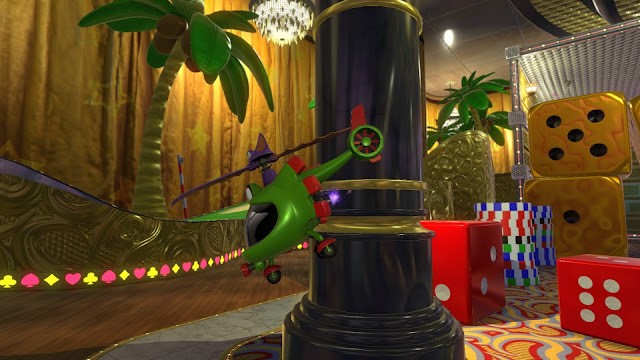 Thankfully, the different amount of collectibles in Yooka-Laylee is closer to Banjo-Tooie rather than the ridiculous level that was seen in a game like Donkey Kong 64. Pagies are to Yooka-Layle what Jiggies were to Banjo-Kazooie and Tooie. These are acquired from performing specific challenges, whether platforming-related or not within the grand tome worlds. These can be as simple as completing an obstacle course with the required amounts of precision jumping and platforming to something more involved, such as finding four pigs, as is necessary in the first world of the game, Tribalstack Tropics. Many trials for Pagies come in the form of getting through rings like these in a set amount of time. Then, there are Quills to find, and these are used to purchase moves from Trowzer, a snake of a salesman (that's not an insult either-- he's literally snake), who is located in every world. In each, he has a collection of moves that need to be purchased to acquire some of the game's Pagies. Many of the Pagies in the game cannot be collected the first time in a world, so you must go to a later one to buy the required move from Trowzer to revisit the world and get the Pagies you couldn't get before. There are also free moves that Trowzer bestows onto the lizard and bat pair of protagonists, though these are only handed out in the hub world of the game. Collecting all 200 Quills in a world gives you a Pagie, and thankfully tracking leftover Quills in a level isn't as obnoxious as in Banjo-Kazooie. A certain character in the game rewards tonics which can be used (only one at a time) to give off different effects. One of them is an indicator of nearby rare goods, such as Quills (but only after all the other collectibles in a level have been gathered). While you still have to go looking, it makes the process of finding every Quill in a world less of a hassle than in past collect-a-thons of Yooka-Laylee's mold. Fixing the pipes in a squalid sewer system. What won't our heroes do for Pagies? Trowzer's moves are ultra helpful not just because they allow you to get to previously inaccessible places and areas in past worlds, but also because they give Yooka and Laylee more options in how they tackle exploration and platforming. There are some problems, though. For one, the Reptile Roll, a move used to move up slippery surfaces and ramps that Yooka would otherwise slide down on, is a bit unwieldy to control. It doesn't have near as much precision as I would have liked. This makes certain sections of the game more of a headache than they should be. In addition to that, when Yooka and Laylee learn the ability to fly, it makes some platforming challenges easy to cheese. Who needs to climb up this structure filled with danger when you can just fly to the top and get the Pagie on top? Thankfully, Yooka is a cold-blooded animal. Laylee? Well, her nose is red for a reason. Outside of Pagies and Quills, there are Play Coins, Mollycools, Ghost Writers, Power Extenders, and Butterfly Hearts. There is one Play Coin in each tome world, and by giving these to an adorable T-Rex in the game named Rextro, you can play one of his arcade games. There's one arcade game per world, and these can be a bit time-consuming as well as tough. Well, actually, the last two arcade games err more on the side of time-consuming and tough than the first three. Regardless, you need to play the arcade games at least twice: once to just beat it for a Pagie and the second time to beat Rextro's high score for his second Pagie. The games range from a top-down racer to a game reminiscent of Flappy Bird, though much less unforgiving. That said, you can really feel the need to bash your head against a wall on some of these mini-games, being borderline un-fun rather than enjoyable. Mollycools are required to be found, and like Play Coins, there is one in each world. Giving these to a character named Dr. Puzz transforms Yooka and Laylee into a different form, just like how Mumbo Jumbo did the same to Banjo and Kazooie in their game. Generally, each transformation has one or two real uses in a world in order to get the transformation-required Pagies. From a horde of hungry piranha to a helicopter, Dr. Puzz's D.N. Ray can help our heroic pair out on their mission. 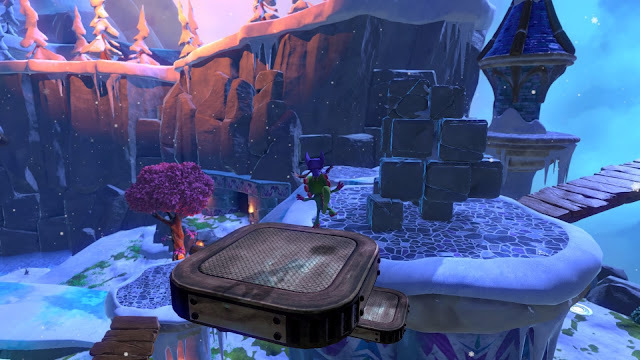 Yooka and Laylee don't have to worry about getting to the chopper. They ARE the chopper! Finally, there are Ghost Writers, Power Extenders, and Butterfly Hearts. The Ghost Writers serve as the Jinjo-like collectibles from Banjo-Kazooie. They're stray beings who when all five are collected in a given world, a Pagie is earned. Meanwhile, Power Extenders and Butterfly Hearts increase Yooka and Laylee's maximum meter for special moves and health respectively. Some challenges that pose too much of a difficulty can be returned to with more special move energy or health in reserve in order to be completed with more ease. Speaking of challenges that pose too much of a difficulty, Yooka-Laylee has a good deal of these. Every world features a mine cart section reminiscent of Donkey Kong Country, though without the same amount of polish. This lack of polish goes into the boss battles as well. Each one besides the boss of the third world has some kind of issue with it. For the first world boss, it's the game's negligence in mentioning that you can stay still in a Reptile Roll, a necessity in order to leap over the logs that roll down the boss' ramp. The second world boss, while easy, goes on for far too long. Then, there's the fourth world boss that takes place entirely on a mine cart track. 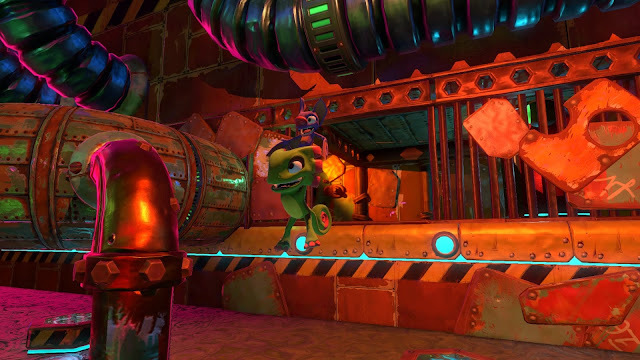 Finally, the fifth world boss has Yooka and Laylee in a pirate ship transformation from Dr. Puzz, which is challenging enough to control by its lonesome, but while avoid boss attacks? Get out of here. 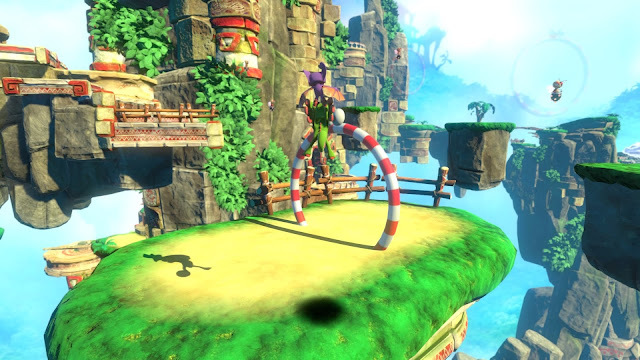 These slightly-to-immensely unpolished segments of game really make wanting to go for 100% completion a challenge, and while I did so as a sucker for collect-a-thon platformers of this type, the lack of polish in particular parts of Yooka-Laylee might turn a lot of players off. Then, there are three quiz segments of Yooka-Laylee that are sprinkled throughout the game and hosted by Dr. Quack. These multiple-choice quizzes test players' observation skills, usually asking questions like where certain photos of the game were taken, what character is on screen, the correct name of a move Yooka and Laylee learn, and things of that sort. However, some are just ridiculous, like asking how long a player's particular save file has been played, how many Quills they have in their collection, and things that the player might not ordinarily consider. Thankfully, the player gets three strikes before they're out and have to restart the quiz, and only a minimum of five or six questions need to be answered (you get to move two spaces out of the ten if you correctly answer a particular question quickly). There are five main worlds in Yooka-Laylee, and these start off as relatively small and easily digestible locales filled with a nice mix of exploration and platforming. Through collecting Pagies of which there are 25 in each world, you can expand these worlds to much larger and expansive levels. Certain sections of level that were either gated off or not there present themselves, such as the second world's Glitterglaze Glacier's central castle, which opens up for exploration when the world expands. Some worlds are more manageable to make a mental map of (wow, that alliteration! ), while others are more difficult due to being split up by various rooms. For instance, it can be momentarily burdensome to remember which entrance in Capital Cashino leads to which area of the world. 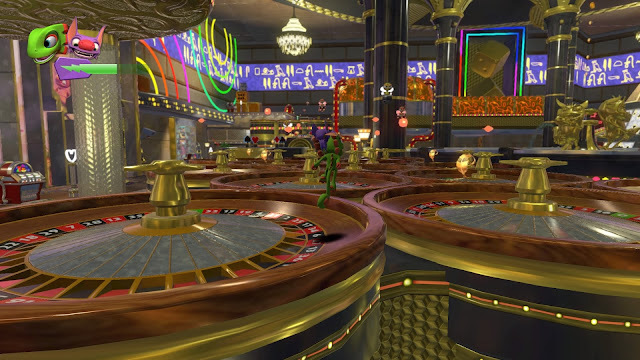 I wouldn't make any bets at this casino, dear friends. The five worlds are all connected by the hub that is the inside and outside of Hivory Towers. As stated, here Trowzer gives players free new moves that would otherwise cost money in the grand tome worlds, and there are 20 different Pagies to collect throughout the walls, halls, and exteriors of the hub world. It's nowhere near as large as Gruntilda's Lair from Banjo-Kazooie, but it can be a bit confusing to remember where all the pathways and passages lead. Indeed, Playtonic Games kept both the good and bad parts of 3D platformers from the 64-bit era by providing a camera that can sometimes be a bit of a pest. Sometimes it's more of your enemy in particularly daunting platforming situations than actual baddies on the screen, getting stuck on walls, and for some reason, facing the doorways of places Yooka and Laylee enter from instead of the opposite way, the direction where players will be walking. Overall, Yooka-Laylee was obviously made on a budget compared to its blatant inspiration, Banjo-Kazooie. Therefore the game is not as polished. At the same time, it's not a disaster by any means like the other really-hyped Kickstarter game that was Mighty No. 9. Instead, Yooka-Laylee succeeds a lot more than it fails. If you're only going to beat the game (which requires 100 Pagies), you can skip a lot of the more annoying, less polished, less smartly designed challenges that are present in the game. Even if you do wish to go for 100%, it's nothing that will get your blood boiling too much. Just understand that some portions of the game are not as adequately thought out as others. 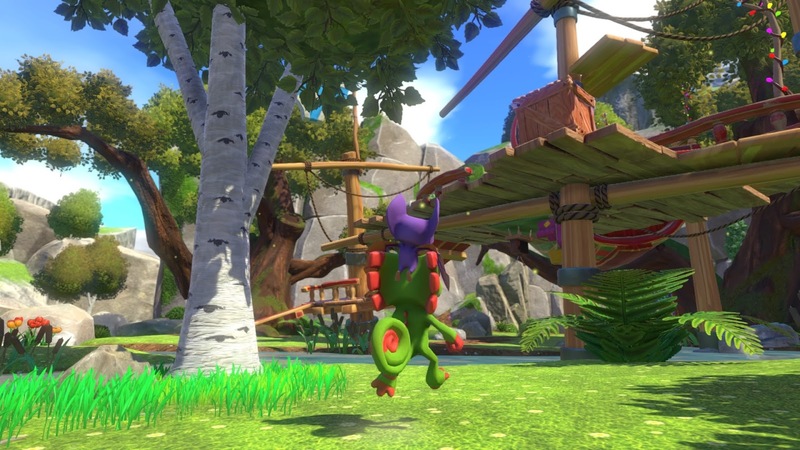 Other than that, Yooka-Laylee gives players exactly what they wanted and what the developers set out to do: basically directly imitate nearly everything from Banjo-Kazooie for one new game, and it does so with above average results.